Shane Buchwald just won his first-ever World Series of Poker gold bracelet in his first-ever WSOP event. Buchwald will take home $177,985 and the bracelet after winning Event #24: $1,500 Limit Hold'em. The event drew 616 players and a prize pool of $831,600. Buchwald managed to beat a table full of players who were each seeking their first WSOP bracelet. Day 3 started with 15 players, including three-time WSOP bracelet winner Barry Greenstein. Buchwald started the day in fifth position and took control late in the final table on his way to winning the bracelet. Greenstein was eliminated in 11th place and took home $9,085. Buchwald won the final six hands of the heads-up portion of the tournament to eliminate second-place finisher Venkata "Sandy" Tayi. Tayi got his final chips in with jack-high versus ace-high and missed a flush draw and a straight draw to be eliminated in second place. Buchwald also eliminated Ray Henson in third place. The two were in for three bets apiece preflop, and Buchwald flopped a pair of nines against Henson's ace-high. He also eliminated fourth-place finisher Shane Fumerton when he made a flush in a four-way pot that left Fumerton eliminated and Henson short. Nancy Nguyen entered Day 3 as the chip leader and eventually finished in fifth place at the hands of Tayi, who flopped a set and turned a full house. Tayi also eliminated Hod Berman in sixth place when he turned two pair against Berman's single pair with ace-high. Kevin Lizak got his last chips in against Fumerton with ace-high. 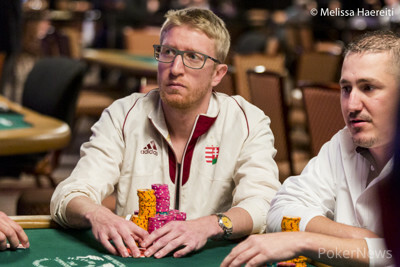 Fumerton flopped a pair of kings and sent Lizak to the rail in seventh place. Lizak was the one who sent Mark Bassaly home in eighth. Bassaly, who was sporting the loudest rail of the day, was eliminated when he got ace-king in against Lizak's king-ten. Bassaly flopped an ace, but Lizak went runner-runner tens to win the hand and send Bassaly to the rail. Tung Tran flopped a set, but Buchwald turned a flush to send him home in ninth place. Reflecting on his runner-up finish and second cash of the WSOP this year, Venkata “Sandy” Tayi was upbeat on coming so close to his first bracelet. 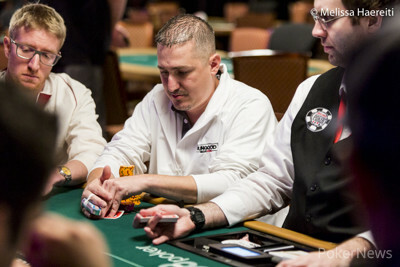 “When I sat down on the first day I said I was here for the bracelet not the money, and I came pretty close," he said. 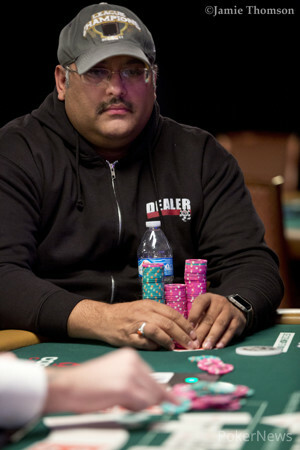 “I want to shout out to my dad in India who has been watching the updates on PokerNews and WSOP. I think you guys are doing a great job in getting the news out there. Meanwhile, Shane Buchwald said it was “hard to believe” after winning an event he hadn’t even planned to play. “I’m living in southern Brazil right now. I registered this tournament after a 24-hour flight; I came here with a friend who is a limit hold’em regular and he wanted to play this. By the end of four levels, I was falling asleep at the tables! “It’s the first WSOP event I’ve ever entered, and somehow, I built up a stack and ran really, really well! Despite never playing a hand of full-ring limit hold’em in his life, Buchwald says that he has played over 20,000 of heads-up limit hold’em over the course of his poker career. 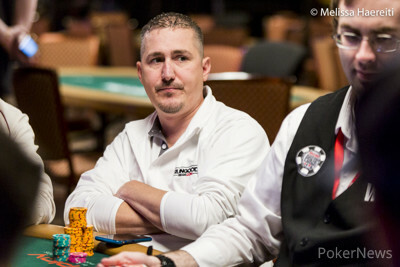 “In limit hold’em, you have to make some marginal decisions, but it’s pretty straight-forward. You can’t make that many huge mistakes. I just tried to keep myself above ten big bets the whole time, and as long as I was around there, I was pretty happy." And as for his plans for the future? “I’ve recently signed up for culinary school, trying to get out of poker," he said. 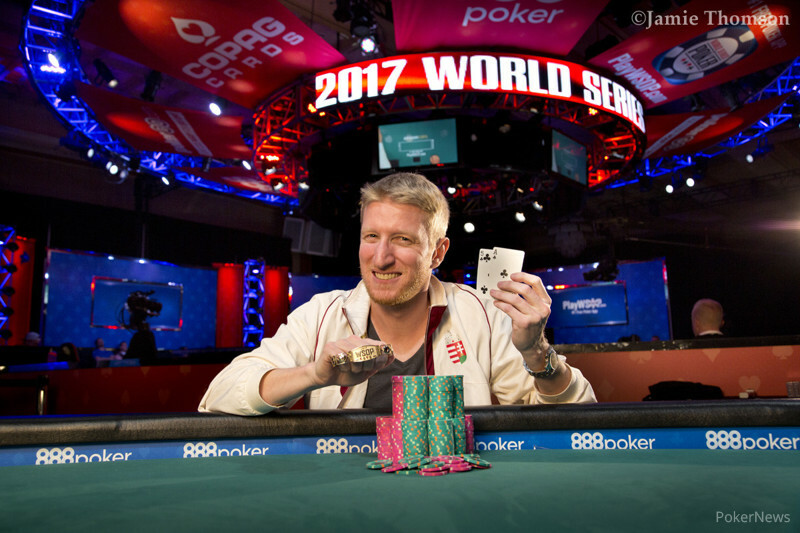 "I’m quite content to stick with my one-from-one in WSOP events. This is as probably as good as it gets. That concludes Event #24 $1,500 Limit Hold'em. PokerNews will be covering all the events at WSOP 2017 and you can find updates on all the events until the Main Event Champion is crowned. Hand #159: Shane Buchwald raised, and Sandy Tayi called with half of his chips in the pot. He got his remaining chips in with against the of Buchwald. The board ran out , and Tayi was eliminated in second place. 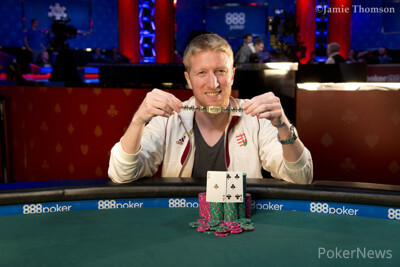 Buchwald won his first-ever World Series of Poker bracelet and $177,985. Meanwhile, Tayi collected $109,968 for his second-place finish. Hand #151: Sandy Tayi raised, and Shane Buchwald folded. Hand #152: Buchwald raised, and Tayi called. The flop was , and Tayi checked. Buchwald bet, and Tayi folded. Hand #153: Tayi raised, and Buchwald called. The flop was , and Buchwald check-called Tayi's flop bet. The turn was the , and both players checked. The river was the , and Buchwald bet. Tayi called, and Buchwald won the hand, showing . Hand #154: Tayi got a walk. Hand #155: Tayi raised, and Buchwald three-bet. Tayi called, and the flop came . Buchwald checked, and Tayi bet. Buchwald called. The turn was the , and both players checked. The river was the , and Buchwald bet. Tayi folded. Hand #156: Buchwald raised, and Tayi called. The flop came , and both players checked. The turn was the , and Tayi checked. Buchwald bet, and Tayi folded. Hand #157: Buchwald got a walk. The two remaining players are going on an early dinner break and will return around 9 p.m.
Shane Buchwald raised from the button. Ray Henson three-bet from the small blind. Sandy Tayi folded the big blind, and Buchwald called. The flop was , and Henson bet. Buchwald raised, and the pair proceeded to get the rest of Henson's stack into the middle. 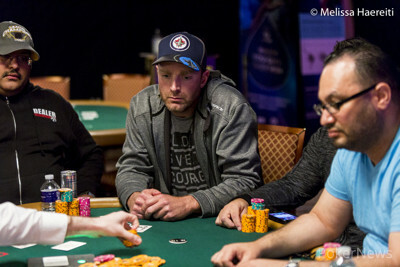 The turn was the and the river the , meaning Henson was eliminated in third place for $75,780. Hand #142: Shane Buchwald got a walk in the big blind. Hand #143: Sandy Tayi raised and took down the pot. Hand #144: Ray Henson got his remaining stack in preflop against Tayi. The board ran out , and Henson doubled up. Hand #145: Tayi raised, and Buchwald called. Tayi bet the flop, and Buchwald called. The turn was the , and Tayi check-folded to a bet. Hand #146: Henson received a walk in the big blind. Hand #147: Buchwald raised, and Tayi defended his big blind. The pair checked the flop, and Tayi check-called a bet on the turn but check-folded to a bet on the river. Hand #148: Tayi raised, and Buchwald called blind on blind. The pair checked the flop before Buchwald folded to a bet on the turn. Hand #149: Henson received a walk in the big blind. Shane Fumerton raised. Shane Buchwald called. Ray Henson three-bet, and Sandy Tayi called. Fumerton then four-bet all in for 150,000. Buchwald called before Henson re-raised to 190,000. Tayi and Buchwald both called. With Fumerton all in, the three remaining players saw a flop of . Henson bet, and the other two players both called. The turn was the , and Henson checked to Tayi who bet. Both opponents called. The three players checked the on the river, and the hands were shown. Buchwald showed for both a straight and a flush. Henson mucked his hand, and Tayi flashed before it, too, joined it in the muck. Fumerton showed and was eliminated, taking home $53,102 for his 4th place finish. Hand #138: Ray Henson raised, and Sandy Tayi called, as did Shane Fumerton. The flop was . Tayi checked. Fumerton bet, and Henson raised. Tayi then three-bet, and Fumerton thought about his decision before folding. Henson was all in, and he turned over , while Tayi showed . The turn was the and the river the , and Henson doubled up. "Why?" asked Fumerton on his return to the table. "Why does that hand play that way?" Hand #139: Fumerton raised and took down the pot. Hand #140: Tayi raised and took down the pot.